The Dublin Core Metadata Initiative is pleased to announce that it has accepted responsibility for maintaining the Bibliographic Ontology (BIBO). BIBO is a long-established ontology, is very stable and is widely used in bibliographic linked-data. We are also very pleased to announce that Bruce D'Arcus has joined the DCMI Usage Board, and will act as the point of contact for issues relating to BIBO. BIBO was designed to complement the Dublin Core, and so it's a natural evolution to have the DCMI take over long-term hosting and maintenance of the ontology. The organisation's experience and success with such metadata work will ensure BIBO continues to serve the metadata needs of diverse communities. In 2007 BIBO was created as a seamless supplement to Dublin Core. More than eleven years later, I am glad to announce that the DCMI agreed to take over the long term development and hosting of the ontology such that it always continue to fulfil its role for years to come. 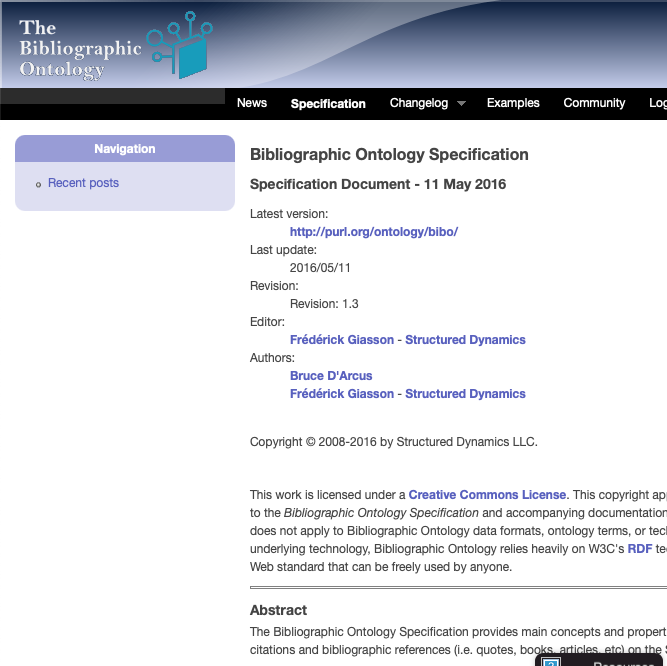 BIBO is currently hosted at http://bibliographic-ontology.org. However, over the next few months, DCMI will assume responsibility for maintaining BIBO PURLs, and will transfer the supporting resources (such as the BIBO website) over to DCMI infrastructure.